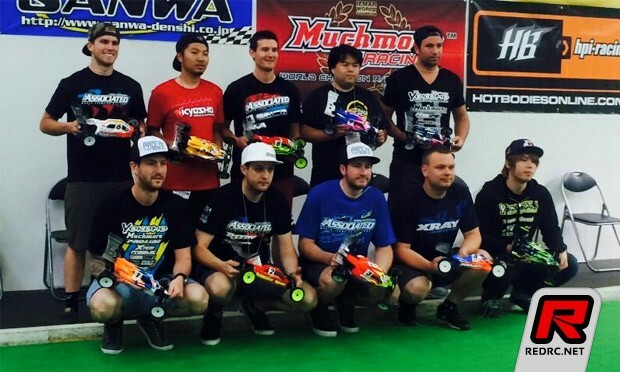 The warmup event for October’s IFMAR 1/10th electric offered World Championships is taking place at the World famous Yatabe Arena in Japan this weekend. Running alongside the Japanese National Championships the event has attracted a number of overseas drivers, there to test their equipment and skills on the newly readied astro turf surface. Following a day of 2wd practice and qualifying with a similar day for 4wd it was EOS Champion Lee Martin who took his Yokomo to the TQ position after 4 rounds in front of US Associated designer Kody Numedahl 2nd and former World Champion Neil Cragg in 3rd. 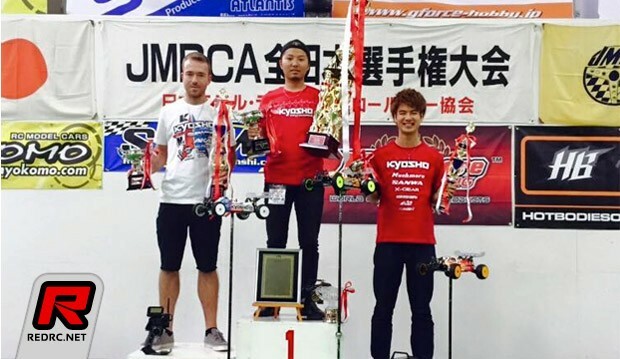 In 4wd it was 4-time onroad World Champion Naoto Matsukura, driving for Kyosho, who ended qualifying on top with Kyosho team mates Yusuke Sugiura and current 2wd World Champion Jared Tebo in 2nd and 3rd respectively. Sunday morning would see the 2wd portion of the event run with triple finals for the A-main finalists. A1 would see the win go to Kody Numedahl ahead of Associated team mate Neil Cragg in 2nd, with Lee Martin taking 3rd after an off. A great run from behind for Marc Rheinard saw him go from 10th to finish 4th just ahead of the first Japanese finisher, Yokomo’s Masatsugu Ido in 5th. The 2nd leg would see the top 3 return to their qualifying formation with Martin winning by less than a second from Numedahl with Cragg less than a second further back in 3rd. Ido would again be top Japanese finisher in 4th with Martin Bayer coming home in 5th. The 3rd and deciding final would once again go to top qualifier Lee Martin with the quickest finishing time from all 3 legs, less than a tenth of a second off making 16 laps. Cragg would take second after Numedahl crashed out after 2 laps. The win in A3 would secure the British Yokomo driver the overall win with Numedahl leading the Associated pairing with 2nd in the final standing and Cragg 3rd. Ido would take 3rd in Leg 3 to take 4th overall and with it clinch the Japanese National title. 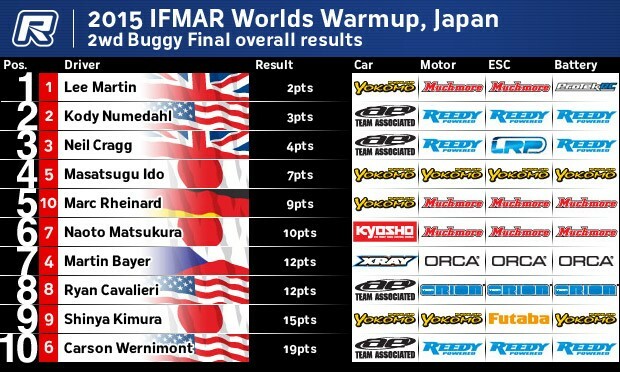 The opening 4wd A-main would see Naoto Matsukura take a convincing win ahead of team mate Yusuke Sugiura, Jared Tebo with a big off that would drop him down the order and see him finish in 9th, while Lee Martin would come from 5th to complete the top 3 just ahead of Xray driver Martin Bayer. Leg 2 would see Jared Tebo take the victory after a rough two laps for Matsukura allowing the US Kyosho driver to jump the top from where he wouldn’t be caught despite Naoto running the fastest lap of the race, and the only driver to drop into 18 seconds. Lee Martin would once again finish in 3rd with Kai Kikuchi taking 4th from 10th on the grid. 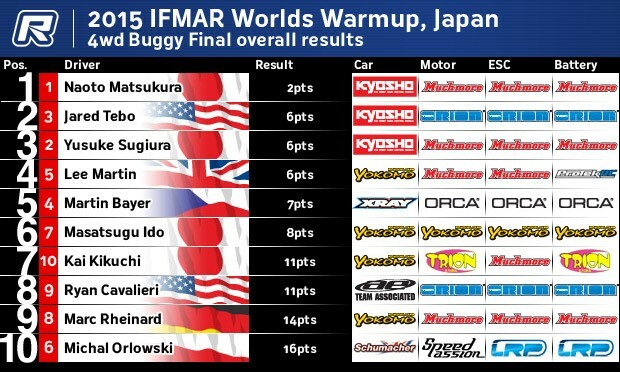 In the final main it would be Naoto Matsukura who cruised to the win by 6 seconds ahead of Masatsugu Ido in 2nd with Martin Bayer finishing 3rd after a race long battle with Sugiura. Jared Tebo would take 5th following a great comeback from a disastrous opening lap that saw him drop to last at the end of the first lap. 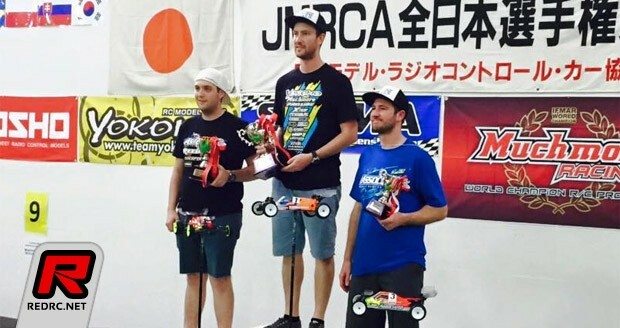 The result netted Matsukura the overall win, as well as another Japanese National title, with 2nd overall going to Jared Tebo who took the spot on tie break thanks to his A2 win, 2nd to 4th finishing on the same points. 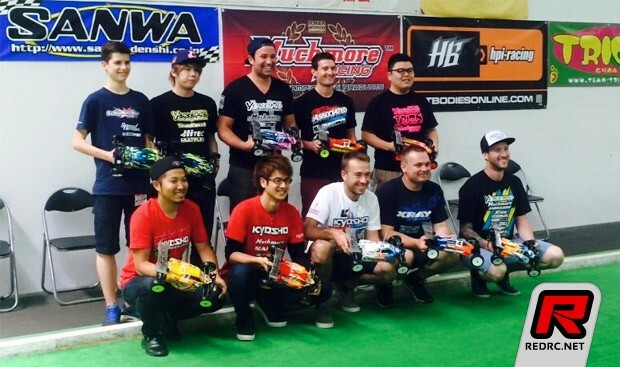 Kyosho would complete the podium as Yusuke Sugiura took 3rd with Lee Martin taking 4th and Martin Bayer completing the top 5. Thanks to Joe Pillars and Takashi Iha for the images.